Reward and Consent™: ABA Leaks finds that while B. F. Skinner (1958) led behavioral psychology, his followers tortured, maimed, and killed eight rhesus monkeys. ABA Leaks finds that while B. F. Skinner (1958) led behavioral psychology, his followers tortured, maimed, and killed eight rhesus monkeys. This most powerful editor of Applied Behavior Analysis (ABA) journals undoubtedly approved the experiment. This example of abusive and deadly behavioral psychology comes from the very beginning of the Journal of the Experimental Analysis of Behavior (JEAB), which was the precursor periodical to their human behavioral control Journal of Applied Behavior Analysis (JABA), both of which the Society for the Experimental Analysis of Behavior still publishes, and which B. F. Skinner led, at first. They took eight rhesus monkeys, restrained them, yoked them at the neck, and delivered painful currents of electric shock to their feet, which they could temporarily avoid by by pulling on a lever to delay the punishment. They ran their experiment all day long for up to seven weeks at four alternating, six-hour-long, condition-on vs. condition-off intervals per day. These primate cousins to homo sapiens developed ulcers and died, or as they put it, they "expired," or they were "sacrificed." 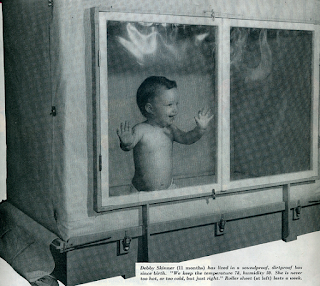 After the first monkey died, they continued running the experiment, killing one animal after another, all for the "noble aim" of "accomplishing effective, scientific behavior modification" on very young autistic children, which is the population they primarily target in their marketing campaigns and media "dissemination groups." We see in this picture that the foundational roots of Applied Behavior Analysis (ABA) guidance was then (and still remains) nothing more than the highly immoral by-any-means-necessary approach to problem solving, which has always been the philosophy of torture and murder throughout the world, for human and non-human victims alike, as caused and provoked by behaviorists or otherwise. Bradly et al. (January 1958). Avoidance behavior and the development of gastroduodenal ulcers. The present report describes the results of an experiment designed to define some of the more specific behavioral factors contributing to the etiology of this lethal pathological picture. 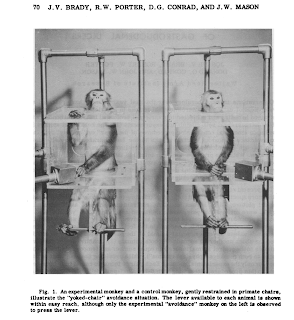 Eight rhesus monkeys, restrained in chairs, as illustrated in Fig. 1, were divided into pairs and conditioned according to a "yoked-chair" avoidance procedure. Each pair of monkeys received brief electric shocks (5 milli-amperes, 60-cycle AC, for 0.5 seconds) to the feet from a common source every 20 seconds unless the experimental animal of the pair pressed a lever which delayed the shock another 20 seconds for both animals. 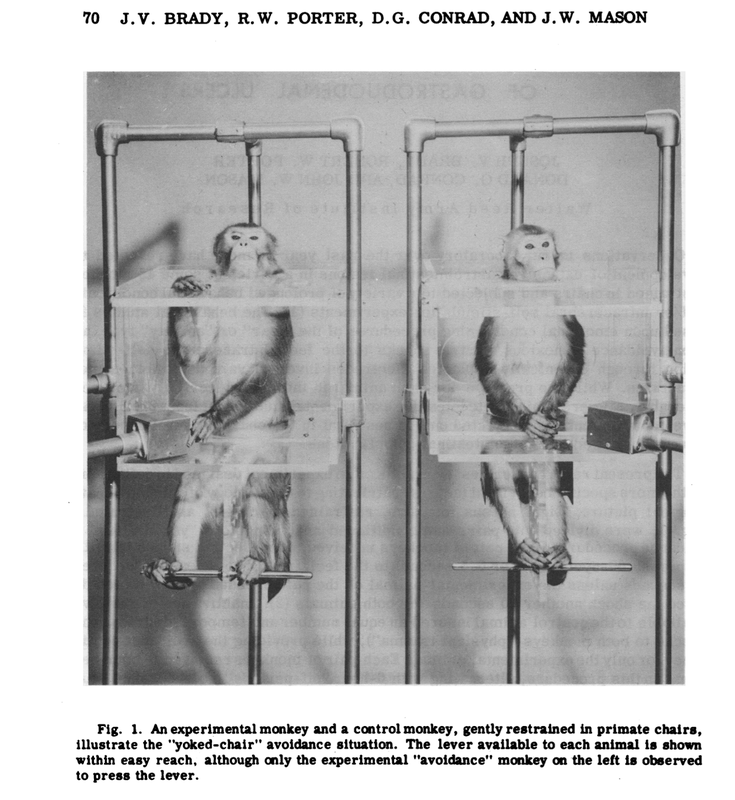 Inactivation of the lever available to the control animal insured an equal number and temporal distribution of shocks to both monkeys ("physical trauma") while providing the avoidance contingency for only the experimental animal. Each pair of monkeys received 6-hour sessions on this procedure, alternating with 6-hour "off-periods" (no shocks) 24 hours each day for periods up to 6 or 7 weeks. A red light was illuminated in plain view of both animals during the 6-hour "avoidance" periods and was turned out during the 6-hour off periods. The experimental procedure was programmed and the animals' behavior recorded automatically by timers, magnetic counters, cumulative work recorders, and associated relay circuits. Lever responses and shocks were recorded continuously for all animals, and separate counts were maintained for the avoidance periods and for the off-periods. Throughout the entire experiment, urine was collected continuously from all animals in 24- or 48-hour samples for 17-hydroxycorticosteroid determinations. With the first pair of monkeys, the death of the avoidance animal after 23 days terminated the experiment during one of the 6-hour avoidance periods. With the second pair, the avoidance monkey again expired during one of the 6-hour "on-periods," this time 25 days after the start of the experiment. With the third pair in this series, the death of the experimental animal again terminated the experiment during one of the avoidance cycles, this time only 9 days after initiation of the alternating 6-hour on-off procedure. And the experimental animal of the fourth pair of monkeys was sacrificed in a moribund condition after 48 days on the avoidance procedure. In all instances, gross and microscopic analysis revealed the presence of extensive gastrointestinal lesions with ulceration as a prominent feature of the pathological picture in the experimental animals. However, none of the control animals sacrificed for comparison with their experimental partners and subjected to complete post-mortem examination, showed any indications of such gastrointestinal complications. That Skinner opposed punishment is only a myth, and a false one at that. As it turns out, he only opposed punishment for so-called "normally-behaving, non-deviant" people. In January 1958, B. F. Skinner was a founding member of the Board of Editors of JEAB when his team did this to their captured lab animals. He sat at the helm while ABA tortured and abused whom they called a "sissy" boy, who eventually committed suicide. He (1968) led ABA and sat on its editorial board when JABA 1(1) (Risley, 1968) skin shocked a young "deviant" autistic girl for climbing on their precious family furniture. They did not take her to a gym or bolt the bookshelf to the wall or install a set of "monkey bars" in the yard. She could have been an Olympic gymnast, given the not-uncommon autistic genius at narrowly-focused and highly-specified excellence and phenomenal skill at that. Instead, they shocked this climber "for her own benefit" so she wouldn't fall down and hurt herself, supposedly. This is their way. So she won't hurt herself, ABA will torture and abuse her and take away any sense of self-determination she had possessed free climbing, nimbly, no doubt. That is not very smart. Here is the logic. She might hurt herself. So before she does, if she does, which we don't know for if she will, we will hurt her instead of letting her hurt herself, if that should ever happen to this highly-skilled climber. In the Boston Globe he (1985) actually praised his Harvard University pupil Matthew Israel, the founder of the Judge Rotenberg Center of high-voltage ABA skin shock, which the U.N. calls an institution of "torture." See Méndez (2013, p. 85). Today, the Fourth Edition Task List of the Behavior Analyst Certification Board (BACB) contains exactly ten "punishment" skills and concepts that every Board Certified Behavior Analyst (BCBA) must master to receive and maintain their credentials. This is what they proudly call their "aversion therapy." An oxymoron is a contradiction of terms. The burden rests on ABA to explain how an aversion therapist is someone whom we all simply want to go away and to leave us alone. Since when is torture a therapy? ABA is clearly nowhere near as positive as it usually claims it is. We are ABA Leaks of Facebook. We are the team of actually autistic and other kinds of investigative journalists who first exposed this Skinnerian myth of non-punishment as a mass-scale ABA falsehood. For many years he even fooled me, Dave Altieri of Facebook. I took his word at face value in blog herein since 2007 when I first read him proclaim to the world in Science and Human Behavior that "in the long run, punishment, unlike reinforcement, works to the disadvantage of both the punished organism and the punishing agency" (Skinner, 2014/1953, p. 183). It was only recently that our top notch disabled Rutgers University librarian retrieved for us the Boston Globe article of Skinner praising Israel. It's only on our public link at our Google Drive that you can find this article freely on the internet. But yes! He was right, indeed! Punishment is addictive, yet, as he showed. Though he fell prey to the very same force he warned us about. I do it, too, at times, and I regret it so much afterwards, except for our argumant of non-submission to bullies is a contingency under which we promote, but only when ethical, legal, safe, and fully-supported when challenging them. We hold no compunctions in the stopping of bullies behaviorally, especially when the bullies are adults and behaviorists or psychiatrists. Therefore, we can only conclude now that even B. F. Skinner is no Skinnerian when it comes to following his own doctrines. We have just documented this line of thought, clearly, and indisputably. We welcome dialogue with ABAers on this one. Let's see if they bite. Well now we have another announcement to make. It seems highly probable that Skinner himself was an autistic man, which is a major, major atheistic sin for anyone to announce under any misjudgmental, popular-norm-of-the-day, submission-and-obedience-training-into-forced-normality ABA standards. 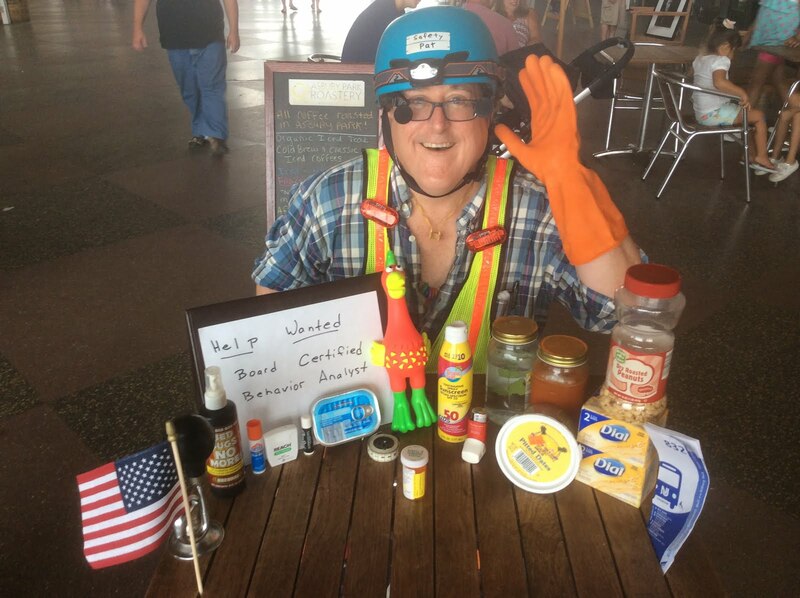 To know an autistic savant genius is to draw a striking resemblance to this intense tinkerer, their guru inventor, that highly-organized and well-driven-and-focused laboratory experimenter. Isn't that queer? Anyhow, getting back to his group, ABAers are Empathy Disabled and low of Emotional IQ (EIQ). His sheeple cult members are in no position to call us inferior while they possess another of their diagnosable malodies, the ABA Superiority Complex. They are simply our equals. We are disabled and so are they. So we love them as such, even though they don't yet want to be our friends. Oh well. We intend to bring them out of their bullying misery. That is how we show them our love. In the end, they thank us, and unblock us, and so on and so forth. We mean them no ill will. But, sadly they must feel this compulsion to manipulte and control bodies and lives that are not theirs. They follow a cult, which is actually a system of pseudoscience that merely masquerades as a real science. It punishes its own dissidents, some whom we know, and it does all it can to silence and suppress the voice of its opponents speaking. But alas, no scientific system always only paints a rosy picture of itself. Some day, we hope, they'll look at ALL the "data," including the reams of data we have accumulated about their "socially important" problem behaviors. They will not even talk to us or any other of their opponents about the PTSD traumas they cause us. They actually dismiss bona fide research methodology, anecdotal self-report evidence. Unilaterally they will often deem it to be "unscientific." But there are good ways to help autistic children with no ABA coercions. Only we proudly-identified "autistics" can lead parents away from their attachment to ABA control and environmenal dominance over defenseless little children. Ask an actually autistic adult or even a teenager, parents. We usually don't ask for a penny to give you advice. Only we know the sheer beauty of the autistic mind. We're here to help our very young autistic peers, the primary victims of the ABA industry's massive fraud upon USA taxpayers and the resistant insurance industry, as we see it, and as we continue to expose it. ABA does ABA, not only on little children, but also on the most powerful institutions of the land, on government and big monied interestss, from tropical Hawaii to the vast frozen tundra of Alaska, on past Michigan and down to sunny Florida, and back up again to the Wiccan witch zone of Cambridge, Canton, and Salem Massachusetts, just as much as forced Psychiatry does the same. Alas, we don't just knock them down, however. In the meanwhile, we also offer up, free for the plucking, our codified "Reward and Consent," dual parent and child consent, Cognitive Behavioral Teaching method in blog, complete with Amended Serenity Prayer. We hope you enjoy your reading, friends. Skinner (1945) raised his baby daughter Debbie in a box, as seen in the Ladies Home Journal. See also Altieri (February 16, 2017). The seventh death with Canton, Massachusetts' Judge Rotenberg Center of high-voltage ABA skin shock torture was an unborn baby of a seventeen-year-old girl, according to the Massachusetts Disabled Persons Protection Commission. And see Altieri (May 1, 2017). A Clockwork Orange in Denver. 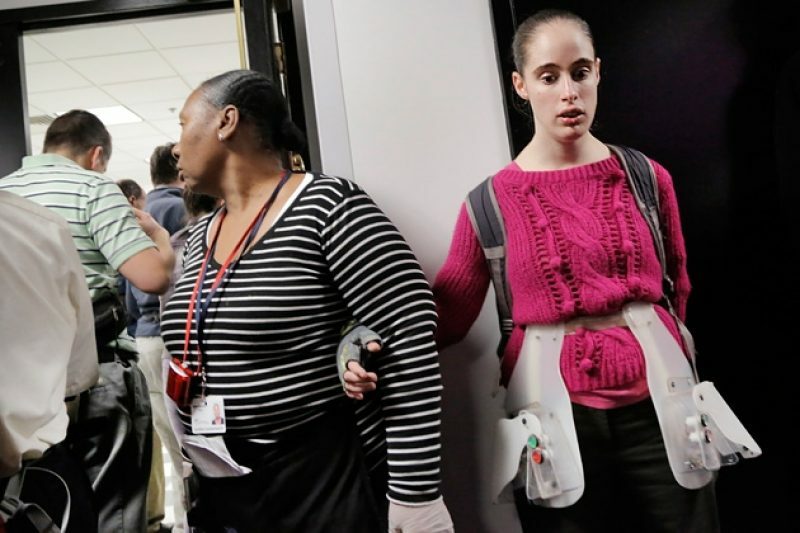 International Applied Behavior Analysis (ABA) convention "approves" Canton, Massachusetts' high-voltage skin "shock therapy" after autistic advocates have told them year after year to stop "approving" this torture. Is all ABA Empathy Disabled? And for the worst of their worst, what they all allow to continue still in their name, see Vogell and Waldman (December 23, 2014). New York City sends $30 million a year to (ABA) school with history of giving kids electric shocks. New York City kids make up the vast majority of the students at Massachusetts’ infamous Judge Rotenberg Center, and keep getting sent there despite repeated evidence of abuse.